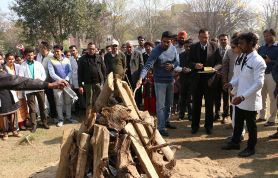 In the program organized under the aegis of JCD Dental College, instituted at the institute, Lohri and Makar Sankranti celebrated at the JCD University premises, the students of Engineering, IBM, Memorial, Education College, Pharmacy and Women and Male Dormitory also organized Sacrifice in fire. 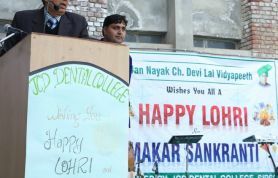 With the help of Dental College, established at JCD University, all other colleges, including the co-operation of Lohri and Makar Sankranti, were celebrated on the occasion of the holy festivities and the students lauded the festival and entertained this festival with amusement through entertaining performances. This program was inaugurated as Dr. R.R.M.L., Director of Education, and as a special guest, by Mr. Siddharth Jhinja, Manager of JCD Dental College, as a special guest by adding sesame seeds and peanuts. This program was chaired by Dr. Rajeshwar Chawla, Principal, JCD Dental College. Apart from him, Mr. Sudhanshu Gupta, Registrar of JCD University along with Dr. Jay Prakash, Dr. Vinay Lathar, Dr. Pradeep Snehi, Dr. Kuldeep Singh, Dr.Himanshu Monga and Engineer BRAD, Principal of different colleges, beside him. Many officials, staff members, and dignitaries were also present. 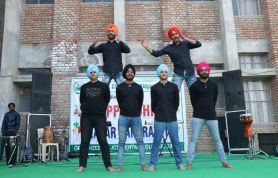 On this occasion, a cultural program was jointly organized by the students of various colleges, in which the program was started by Lohri folklore and after this, various students presented their talents by performing different presentations of their talents Done and made Lohadi memorable. 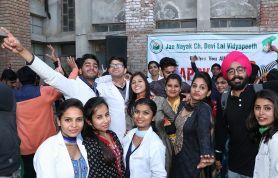 At the same time, students of JCD Dental College also presented various songs on dance songs, Bhangra and Lohadi songs etc. 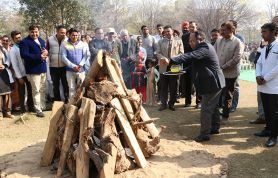 On this occasion, Dr.R.R.Malik, while congratulating the guests of Lohri and Makar Sankranti to all the students and guests, said that the festival of Lohri is a famous festival celebrated in whole of India, which all people with great enthusiasm Celebrate. 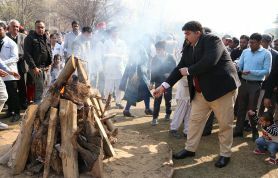 He said that the relation of this festival is a symbol of the prosperity of the fields, the warmth in relation and respect for the winter season. He said that nowadays the younger generation is adopting Western civilization and is forgetting the Tees and Festivals associated with our mythological culture, which is causing the destruction of our culture. He said that you are all young and the same enthusiasm about the kind of enthusiasm that you see in a cultural program should be shown in your teaching and sports and your country should be forwarded and ensure your participation for the country. As a special guest on this occasion, Mr. Siddharth Jhinja, in his address, first conveyed the congratulations of Lohri and Makar Sankranti to everyone, saying that the festivals are symbols of our Indian culture and that is the identity of our Indian civilization. The festival provides us with hope, enthusiasm, and fun. He said that this festival of Punjabi people should be celebrated in a warm and disciplined environment so that they can make our mutual relations better. He said that every festival has its own importance, it is dignity, so we should know them as well as understand the history behind them and also get the education from them. At the same time, Dr. Rajeshwar Chawla, Principal of Dental College, conveyed the congratulations of these holy festivals to everyone in his address and said that while living in discipline, every festival should be celebrated with joy, so that our culture and culture Sanskaras can be saved. 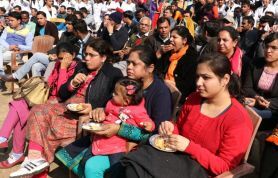 In this program, the principals of all the colleges also conveyed their greetings to the students and the pigeon was worshiped with sesame seeds and ghee in the presence of Lohri and peanuts, rewdi and gajaks were also distributed to everyone present. All the staff members of all colleges and all the students were also present. On the same day, the holy festival was celebrated by the students by arranging programs in the JCD female and male hostels.